kāṇera — the hole of the ear; bhitara — within; vāsā kare — makes a residence; āpane — personally; tāṅhā — there; sadā — always; sphure — is prominent; anya — other; śabda — sounds; nā — not; deya — allows; praveśite — to enter; āna kathā — other talks; nā — not; śune — hears; kāṇa — the ear; āna — something else; balite — to speak; bolaya — speaks; āna — another thing; ei kṛṣṇera — of Lord Kṛṣṇa; vaṁśīra — of the flute; carite — characteristics. 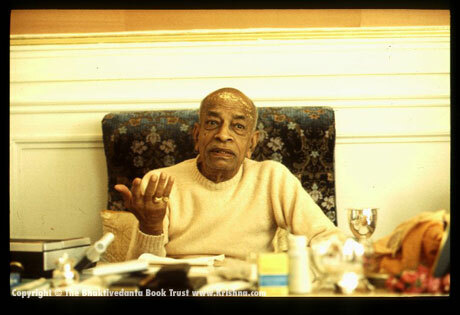 Srila Prabhupada begins this discussion with the topic of meat eating vs. vegetarianism. 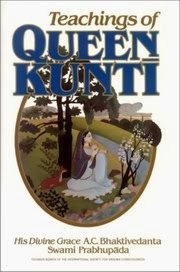 Kuntidevi mentions that the grains are abundant, the trees full of fruits, the rivers flowing nicely, the hills full of minerals, and the oceans full of wealth, but she never mentions that industry and slaughterhouses are flourishing, for such things are nonsense that men have developed to create problems. 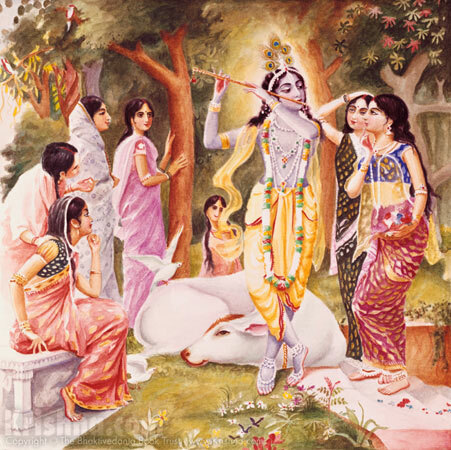 every part of Krsna's body has all the capabilities of the other parts. 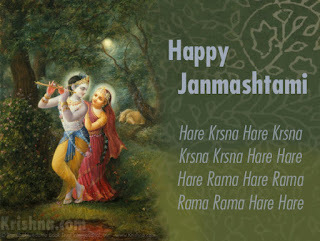 With our eyes we can only see, but Krsna, merely by seeing, can make others pregnant. If Krsna likes, He can produce a huge quantity of grains, fruits, and vegetables, but if Krsna desires to restrict the supply, what good will meat do? You may eat me, or I may eat you, but that will not solve the problem. 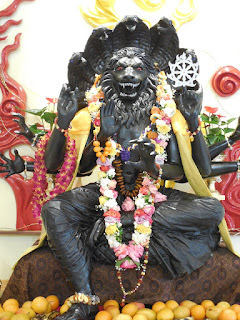 This is what Bhaktivinoda Thakura teaches us when he says, marabi rakhabi--yo iccha tohara: "My dear Lord, I simply surrender unto You and depend on You. Now if You like You may kill me, or else You may give me protection." 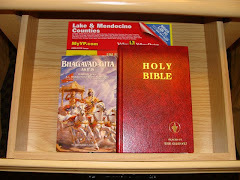 And Krsna says in reply, "Yes. Sarva-dharman paritajya mam ekam saranam vraja: simply surrender exclusively unto Me." 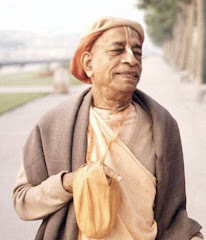 He does not say, "Yes, depend on Me, and also depend on your slaughterhouses and factories." 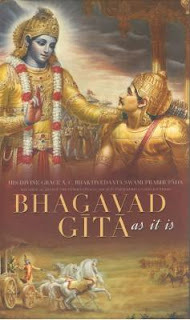 "The spirit of Bhagavad-gītā is mentioned in Bhagavad-gītā itself. It is just like this: if we want to take a particular medicine, then we have to follow the directions written on the label. We cannot take the medicine according to our own whim or the direction of a friend. It must be taken according to the directions on the label or the directions given by a physician. 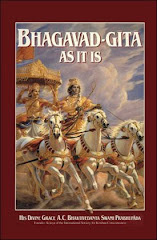 Similarly, Bhagavad-gītā should be taken or accepted as it is directed by the speaker himself." 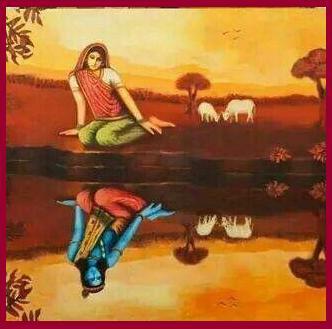 vraje — in Vṛndāvana; vikrīḍatoḥ — while the two of Them were sporting; evam — in this way; gopāla — as cowherd boys; chadma — of the disguise; māyayā — by the illusion; grīṣmaḥ — summer; nāma — thus designated; ṛtuḥ — the season; abhavat — came about; na — not; ati-preyān — very much favored; śarīriṇām — by embodied beings. 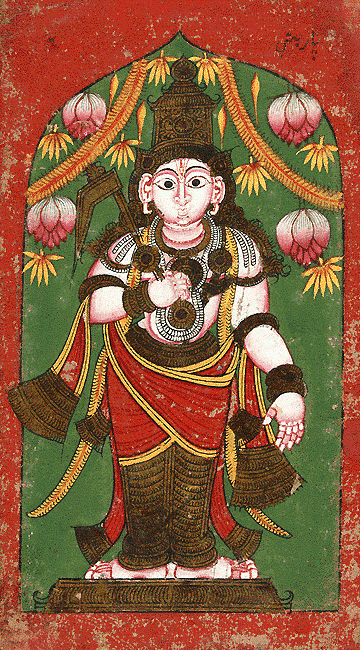 saḥ — this (hot season); ca — nevertheless; vṛndāvana — of Śrī Vṛndāvana; guṇaiḥ — by the transcendental qualities; vasantaḥ — springtime; iva — as if; lakṣitaḥ — manifesting symptoms; yatra — in which (Vṛndāvana); āste — remains; bhagavān — the Supreme Personality of Godhead; sākṣāt — personally; rāmeṇa saha — together with Lord Balarāma; keśavaḥ — Lord Śrī Kṛṣṇa. 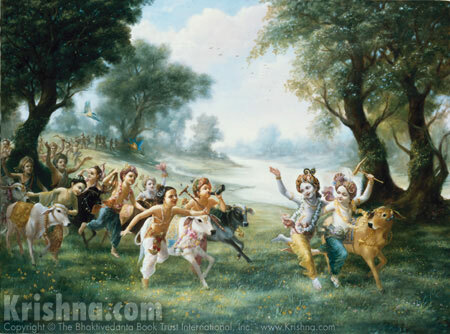 While Kṛṣṇa and Balarāma were thus enjoying life in Vṛndāvana in the guise of ordinary cowherd boys, the summer season gradually appeared. This season is not very pleasing to embodied souls. 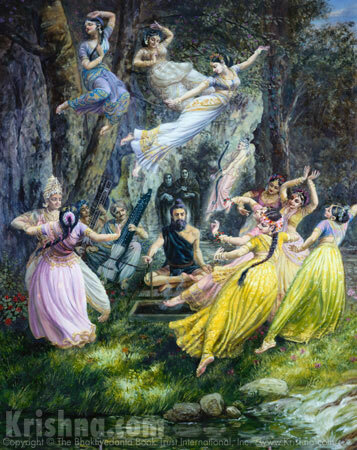 Nevertheless, because the Supreme Personality of Godhead was personally staying in Vṛndāvana along with Balarāma, summer manifested the qualities of spring. 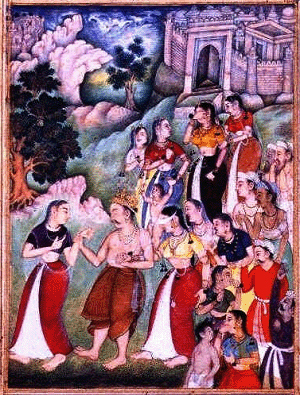 Such are the features of the land of Vṛndāvana. Today it is over 100 degrees here. Many of the people around me are complaining. I like this sloka because it points out that when one is with Sri Krishna discomfort can become very comfortable. Today is the Appearance Day of Lord Balarama. gandharva-apsarasaḥ — the celestial singers and dancing girls; kāmam — Cupid; vasanta — the spring season; malaya-anilau — and the refreshing breeze from the Malaya Hills; munaye — to the sage; preṣayām āsa — he sent; rajaḥ-toka — the child of passion, greed; madau — and intoxication; tathā — also. 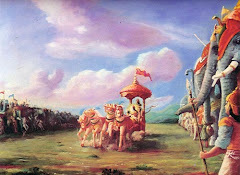 To ruin the sage’s spiritual practice, Lord Indra sent Cupid, beautiful celestial singers, dancing girls, the season of spring and the sandalwood-scented breeze from the Malaya Hills, along with greed and intoxication personified.